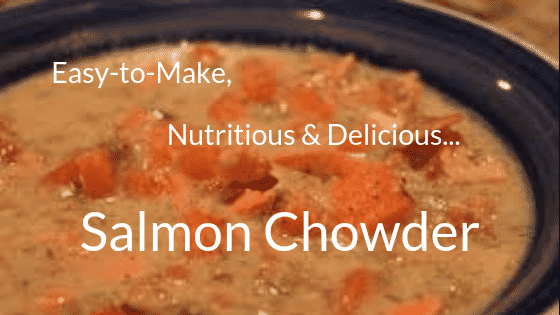 With the cooler weather comes my desire for one of my favorite meals, Sarah Fragoso's Scrumptious Paleo Salmon Chowder. Sarah was one of the first people I followed 10 years ago when we started our lifestyle shift to the paleo lifestyle. (We made the shift after experimenting with the Whole 30 and realizing the foods we were eating were causing inflammation in our guts...not to mention just how much better we felt!) I liked her books because they were filled with recipes that were quick and simple, and we all know how overwhelming it can be when you are trying to make lifestyle changes, so I welcomed her recipes with just a few ingredients with open arms. Her simplicity definitely helped us to learn ingredients, (I learned what a leek was in this recipe!) and how the paleo lifestyle doesn't have to be complicated. Yes, it takes some food prepping to make it happen, or a great food service company like Paleo Works, but you do not have to be a gourmet chef to make delicious paleo meals. As you will see, my commentary on this recipe is actually longer then the recipe itself, even with all of her directions...so you can do this! -Double or even triple it! You will be ticked if you don't. You will want more of it later that week, or you can even freeze it, as it does freeze well if you don't want it again that week. You will need a pretty big pot. -In order to increase the protein, sometimes I actually double the recipe, but triple the salmon. Yes, this means a lot of salmon, which is expensive, so I would highly recommend shopping Costco or Sam's for this recipe, as 3lbs is a lot of fish. But...since I know most of us don't get enough fish in our diets, (2-3x/week is recommended), making a big batch of this and freezing it will help you get closer to that recommended weekly fish intake. If cost is an issue, you can use a cheaper fish, or just don't triple the fish like we do. and I don't add it until the individual bowls are poured so each person can have control over the level of hotness in their own bowl. But...I do have to say, the hot sauce is a must! It doesn't have to be hot, but it does add another dimension of flavor that cuts down on the creaminess of the coconut milk. In a large soup pot, cook the diced bacon until browned and crispy. Add the leeks and continue to saute until the leeks are tender. Add the carrots and cook for another 3-4 minutes. Add the chicken stock, coconut milk, dill, and black pepper and bring to a simmer. Add the salmon filets to the soup, make sure they are covered with the soup, and let simmer until the filets are easy to break apart. Stir well, breaking apart the salmon and cook until all the pieces of salmon are tender. Serves 4-5. Double this recipe for leftovers or if you have a larger crowd to feed. Note from Tara: If you are tracking your food, you will realize this recipe is indeed high in fat and protein, and low in carbs, perfect for the keto lifestyle. If you are a high performing athlete who requires more carbs, you will need to add some form of carbohydrate to be able to fuel your performance. However, if you are just a normal guy or girl like myself, who's goal is to be healthy, then this is a great recipe because it has great ingredients! Remember that everyone's needs are different, and we are here to help you figure out what those needs are, but one thing that doesn't vary from person to person if the need to eat real, whole food, which is exactly what this recipe provides.